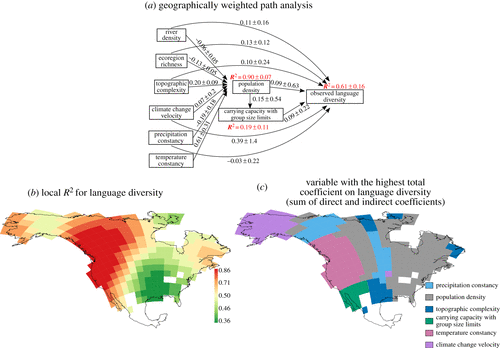 Although many hypotheses have been proposed to explain why humans speak so many languages and why languages are unevenly distributed across the globe, the factors that shape geographical patterns of cultural and linguistic diversity remain poorly understood. Prior research has tended to focus on identifying universal predictors of language diversity, without accounting for how local factors and multiple predictors interact. Here, we use a unique combination of path analysis, mechanistic simulation modelling, and geographically weighted regression to investigate the broadly described, but poorly understood, spatial pattern of language diver- sity in North America. We show that the ecological drivers of language diversity are not universal or entirely direct. The strongest associations imply a role for previously developed hypothesized drivers such as popu- lation density, resource diversity, and carrying capacity with group size limits. The predictive power of this web of factors varies over space from regions where our model predicts approximately 86% of the variation in diversity, to areas where less than 40% is explained. Pacheco Coelho MT, Barreto Pereira E, Haynie HJ, Rangel TF, Kavanagh P, Kirby KR, Greenhill SJ, Bowern C, Gray RD, Colwell RK, Evans N, & Gavin MC. 2019. Drivers of geographical patterns of North American language diversity. Proceedings of the Royal Society, B, Biological Sciences, 286: 20190242. Do you like this, or do you have a comment? Then please follow me at @SimonJGreenhill on Twitter!